The vibrant town of Barnstaple, with its mix of leading High Street names, together with an array of excellent independent and specialist stores, has an envious reputation for providing the visitor with a shopping experience that is second to none in the South West. The town has a truly cosmopolitan flavour when it comes to wining and dining, whether it?s restaurants specialising in international cuisine, coffee shops, traditional Pubs or European style Cafe's; there is something for everyone. There is a vibrant live music scene in the town, featuring the popular genres, a superb 650 seat theatre, attracting world wide celebrities and a large multi screen cinema. If you are seeking knowledge based leisure activities, the town has an excellent library, a museum and several small privately owned galleries. Cyclists can enjoy the 30-mile Tarka Trail tracking the scenic coastline of North Devon. 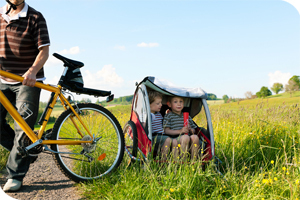 Cycle to various local towns and villages on the Tarka Trail, including Bideford, Instow and Braunton.Other attractions include a leisure centre, indoor tennis, go-karting, ten-pin bowling and pannier market. This is an ideal touring base, being equidistant from the picturesque estuary beach at Instow and the blue-flag surfing sands of Saunton and Croyde, each via a 10 mile scenic drive. The splendour of Exmoor National Park is a little over 5 miles farther. To view all our Barnstaple holiday cottages please see below, alternatively if you would prefer to search by date and criteria please use the search on the left hand side. Review: There's something for everyone. You can go for beautiful walks in the area or stay at the house and read, watch a movie, enjoy the hot tub, ... We really loved that is was so peaceful and quiet, and the view is amazing.